Uzbekistan is located in central part of Central Asia between two rivers, Sirdarya and Amudarya. Being located on the Silk Road, the country has rich historical and cultural background. Uzbekistan is a country of an ancient civilization. There are thousands of monuments of archaeology and architecture preserved on its territory. Numerous manuscripts and items of both ancient and recent past of the area are kept in research centers and museums. A remarkable fact is that many ancient scholars who made great contribution in World's civilization were born in this country. Among them, Al Khorezmi, Al Beruni, Ibn Sina, Al Fergani, Mirzo Ulugbek, At Termezi and many others. It has world-wide-famous ancient cities as Samarqand, Bukhara and Khiva. SAMARKAND is one of the oldest cities in the world, established during the middle of the first century BC under the name Marakanda, later it was Afrosiab. The city was conquered by the troops of Alexander the Great, the Arab Caliphate and Genghis Khan. It was the capital of the powerful state of Sogd, the center of Amir Temur's great empire. Temur was the one who cared about the beauty of the city and its strength as a major capital city in the region. 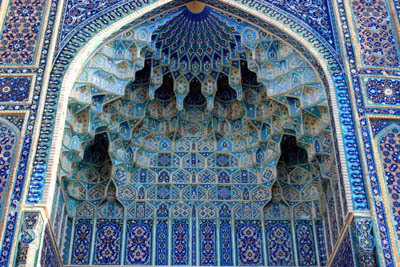 The numerous monuments of Samarkand and its suburbs impress tourists with their beauty and splendor. The refined architectural shapes, intricate ornamentation, mosaics, blue-tile domes and facades are interesting for all who visit these beautiful buildings. Blue is important in decorating buildings, it blends in with the blue sky. 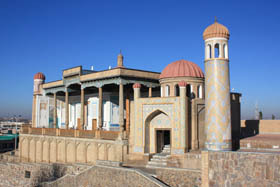 The majestic Registan square consists of three rnadrassas namely the Ulugbek, Sher-Dor and Tillyakari Madrassas. 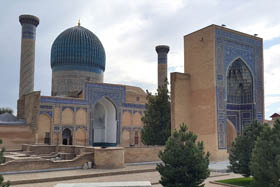 Other places of interest are the Shakhi-Zinda necropolis - most remarkable monument in Samarkand and the Gur - Emir mausoleum - the grave of Temur, his sons and grandsons. The history of the city boasts the names of outstanding writers, scientists and artists from the East including astronomers Kazyzade and Rumi and poets Djami and Navoi.